Keeping your teeth clean and brushed is essential and having a good dental diet is, too! By giving your body the necessary nutrients, not only will you have more energy, you will also stay healthy for longer! And yes, that goes for your teeth as well. Altogether, having good eating habits and diet is essential to everybody. So in this article we seek to let you know about how that same aspect can affect health as well as bring some complications. Typically, when you hear about having a good diet, you might think as babies. But actually it starts at the pregnancy! For this our dentists in Los Algodones recommend foods that have fluoride, proteins, calcium and phosphorous, as well as Vitamin C and D. These components are very helpful to the development of the babies’ teeth and mouth. Once the baby is born, you do not have to worry too much, as breast milk suffices. Breast milk changes and adapts to your baby’s needs, so they will get all the nutrients necessary for their diet. Then, when the kids are old enough to go to school, dairy products prove beneficial. Things with calcium and vitamin D help forming healthy teeth for the young ones. 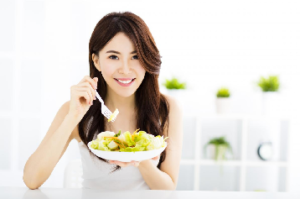 By not eating correctly, it can greatly affect your oral health. Most commonly you would be suffering from cavities and gum disease. The possibility is there as we will shortly explain! You see, cavities are formed when you consume plenty of sugary and starchy foods. 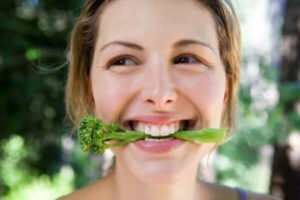 These get stuck to your teeth and gives the bacteria the opportunity to attack more fiercely, as they use these food remnants to produce acid that end up hurting our tooth enamel. This, if left untreated, leads to cavities and tooth decay. And then we have gum disease, which with a poor diet is easy to be more prone of. A lacking diet might make a gingivitis worse, and furthermore, makes the healing process harder. So it is important to eat a balanced meal in order to give the bodies the nutrients it requires. Make sure you are controlling how much sugar you are taking. We all love our sweets every now and then, so it is not about forgetting about them. It is more about not exceeding the amount we take. When consuming food high on starches and sugars, you have to make sure to brush and floss your teeth. It is very easy for these substances to stick to our pearly whites, and as such, it is even easier to develop a cavity. Make sure your tap water contains fluoride. It has been proven that people who drink fluoridated water lower greatly the chances of tooth decay. Other fluoride products such as toothpastes and mouthwashes are more than welcome. Really, anything that can help keeping your teeth going on strong is a great addition. Consume foods that have protein as well as fresh vegetables, while avoiding processed foods. And last but not least, make sure you visit your dentist at least two times a year. They will be help you and keep track of how your teeth are faring. Not only that, but they will recommend and advise you personally! If you are interested in cheap dental treatment and procedures, you are more than free to contact us here in Los Algodones, Mexico. Good prices with an excellent service that leaves nothing but smiles! No Replies to "Importance Of Diet And Nutrition"